Home > Resources > HTC > How to Transfer Apps from HTC Phone to Computer? Currently there are millions of apps available on the Google Play and users are usually spoilt for choice. HTC phone users would want to install as many apps as they could and at the same time be able to capture and store photos and videos as well. However, too many application will certainly occupy too much room on your HTC phone therefore, we have to search for a way to move apps from our HTC phones to other storage devices for backup so that we can delete them from the HTC phone to free up space. It seems difficult to transfer apps from a mobile phone to computer because we can't find them directly via USB connection. But take it easy. 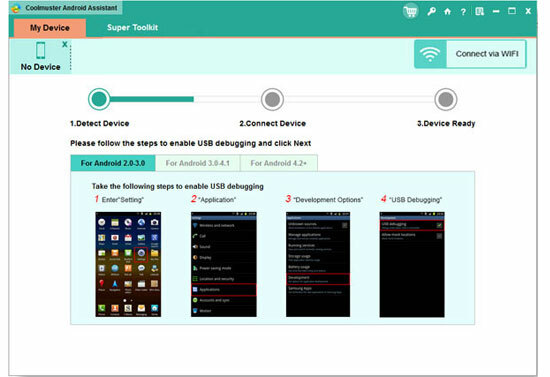 With the help of a third-party tool like Coolmuster Android Assistant, you can safely transfer apps, photos, videos, music, contacts, text messages and many more from HTC Android phones, like HTC One/Evo/Desire/Inspire/Wildfire/HD2/Hero, to computer with 1 click. The following guide will show you how to copy HTC phone apps to computer by using this Android Assistant. Read it after your clicking the button below to get the HTC app transfer tool downloaded on your computer. Connect your HTC phone to PC and launch the Android Assistant. If you haven't enabled USB debugging on your HTC phone before, you should follow the direction in the program interface to accomplish this process. Then touch "USB debugging opened" and "Next", your HTC phone can be detected soon. As soon as it recognizes your HTC device, this program will start to scan your HTC phone deeply. All your HTC data will be arranged into several folders, including Apps, Music, Photo, Video, File, Book, Contacts, etc. Now, you can choose "Apps" and click "Export" button to transfer them to your computer. You can also install and uninstall apps directly on the computer by using this third-party tool.